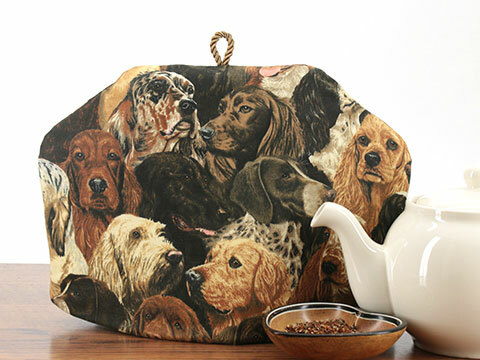 Cats, dogs, birds and more adorn these rather whimsical tea and coffee cozies. 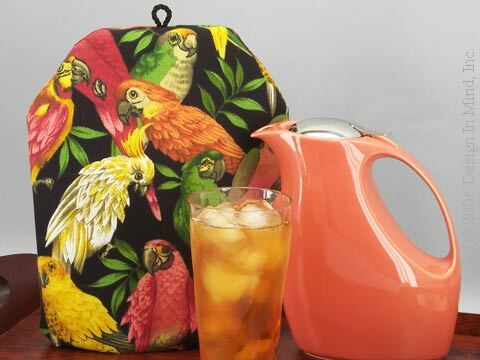 Cat tea cozies, dog tea cozies, and bird tea cozies. 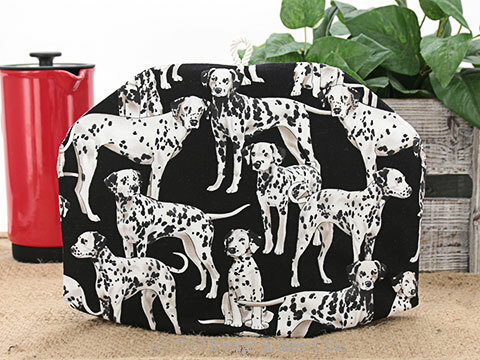 Something for the pet lovers! These cozies are made to order and will be shipped typically within 1 week after your order is received. See the "Quick Ship!" group for tea cosies available to ship now. 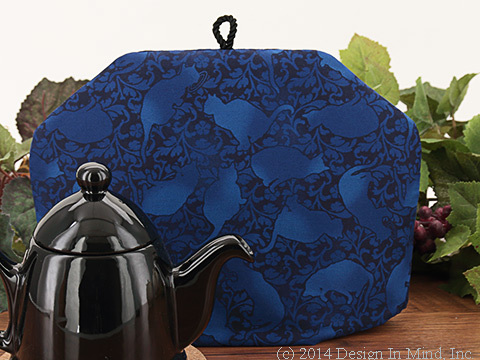 Cat silhouettes in common feline poses cover this graceful tea cozy. Softly mottled shades of blue and black. 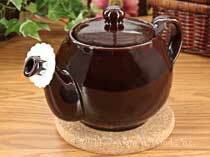 Shown with stoneware teapot in black. 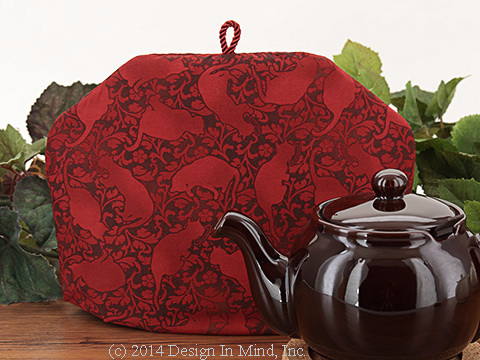 Cat silhouettes in common feline poses cover this graceful tea cozy. Softly mottled dark reds and browns. 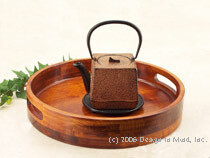 shown with Chatsford teapot in rockingham brown. 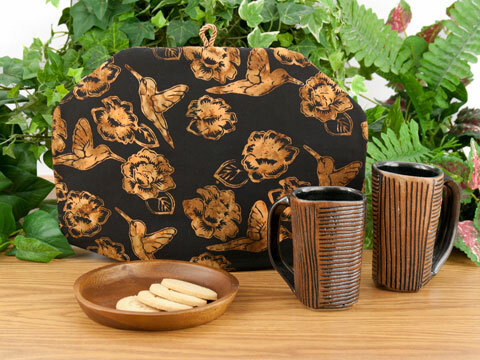 Nocturnal cats keep watch on this batik tea cozy. Shades of brown on an inky blue-black background. Shown with Eva glass teapot. 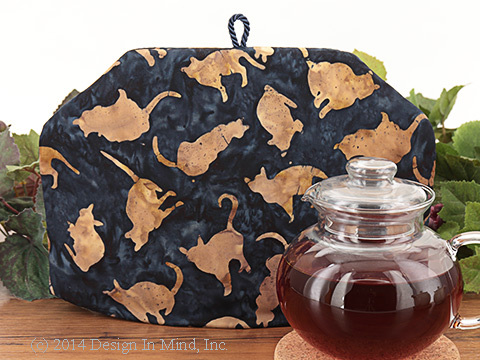 Colorful cats in classic poses cover this bright batik tea cozy. Mostly yellows and greens on one side, blues and pinks on the other, all on a mottled blue/black background. cotton batik fabric. 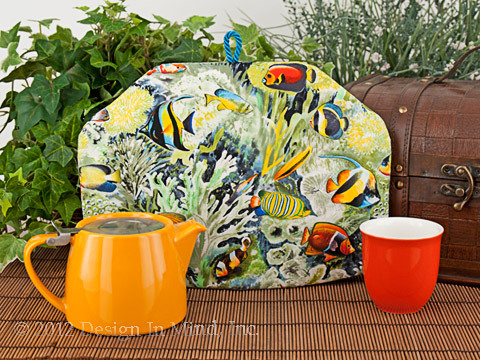 Shown with Krinkle teapots in sky and yellow. 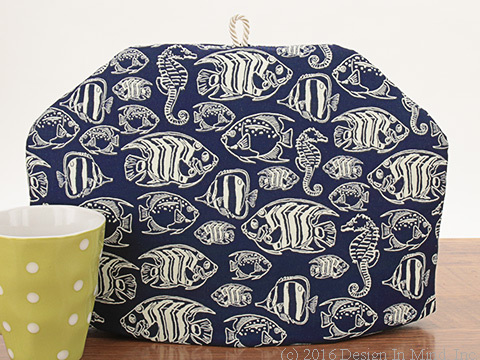 Brightly colored tropical fish swim above the varied inhabitants of a coral reef on this sturdy quilter's cotton tea cozy. 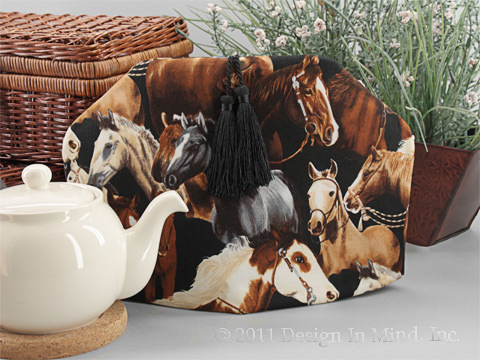 Saddle up with your favorite horse on this Tea Cozy. Horses in black, brown, gray, tan, cream, and white. Black background with a double black tassel. Quilter's cotton. 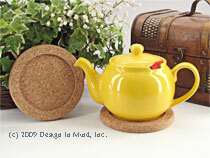 Shown here with a cream colored Chatsford teapot, sold separately. 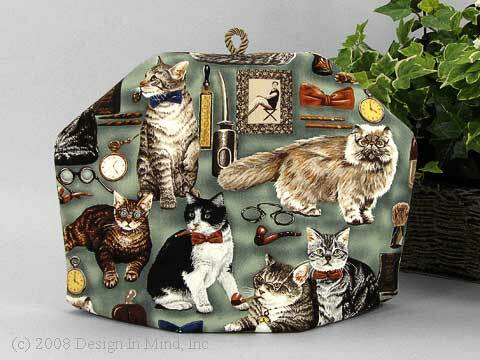 This Tea Cozy features cats and kittens, each with their our style and personality. Soft sage green background with names of cat breeds printed in olive green. Quilter's cotton. 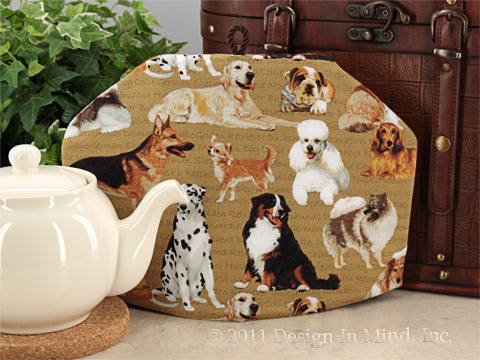 This Tea Cozy features dogs and puppies, each with their our personality. Light golden brown background with names of dog breeds printed in brown. Quilter's cotton. 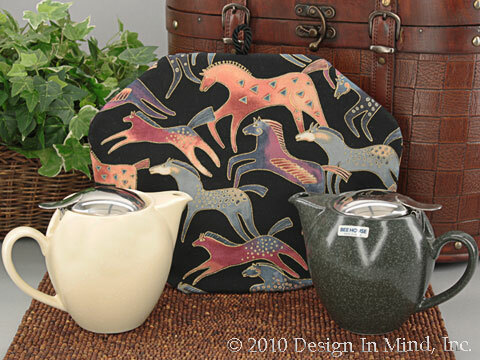 Multicolored horses gallop across this tea cozy. Horses in shades of rust, violet, purple, blue, with a hint of cream outlined in metallic gold on a black quilters cotton fabric. Tea Cozy - What a Hoot! 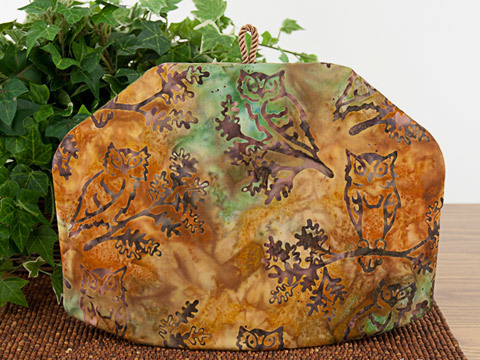 Lots of friendly owls looking at you from this nature colored batik tea cozy. Sienna brown inked owls on tree branches sit on a greens, browns, and oranges batik quilters cotton. 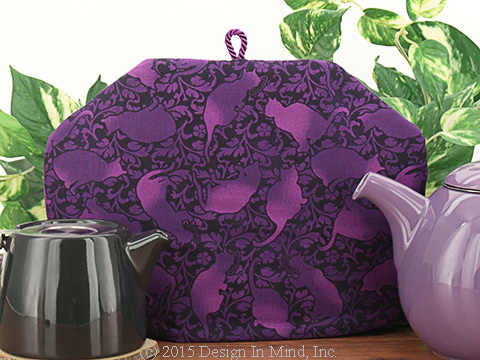 A great wake-you-up tea cozy for your morning tea. Dogs passing the time lounging on multi-colored lap quilts. 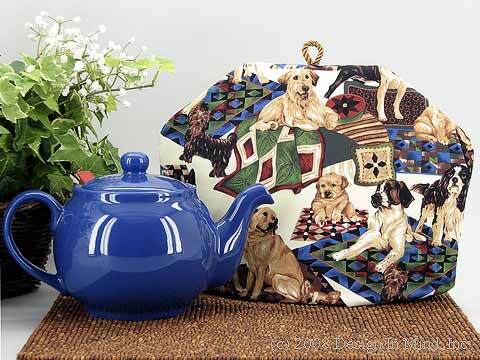 Fabric is a cream quilter's cotton with naturally colored dogs and bright colored fabrics in the quilts. Felines have taken over the University Club. Aristo-cats one and all sit upon a varigated sea-green cotton. White, brown, tan, rust & blue accents. 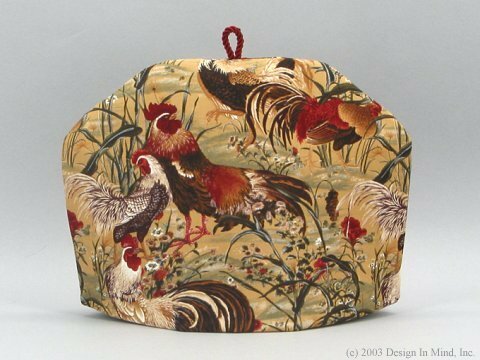 A friendly gold cat sits upon this red and black plaid jacquard tea cozy. Shown with Sorrento mugs in red and gold. 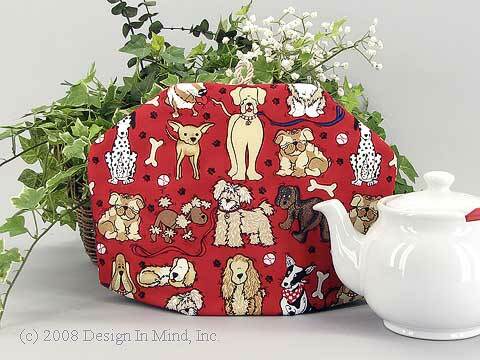 Perky pooches ready to romp cover this bright red tea cozy. Can't you just feel their anticipation and energy? Red quilters cotton with tan, cream, brown, white & black dogs. 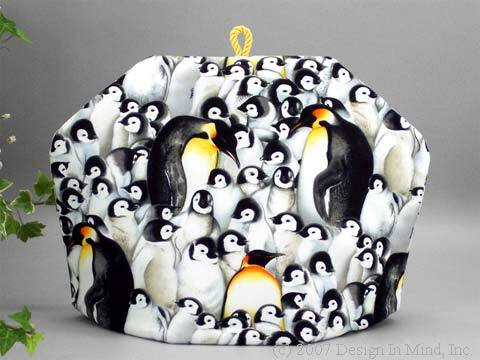 This fun quilters cotton tea cozy is full of baby penguins in black and white "watercolor" with brightly-colored adults looking on. 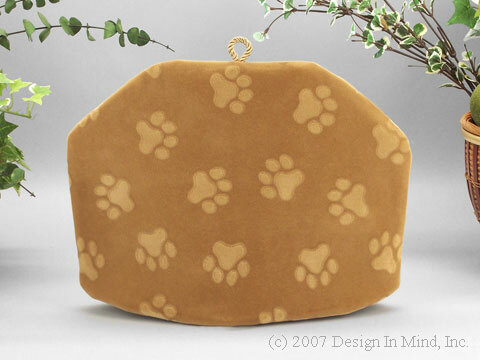 Cute paw prints on a short napped "velvety feel" camel colored upholstery fabric. Beautiful rust, gold, and sage quilter's cotton. Large fancy-tailed roosters having a "field day". 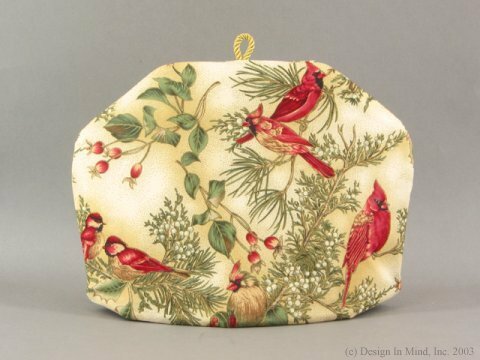 Red cardinals and chickadees on a suede look cream and tan background. Pine green and gold accents. 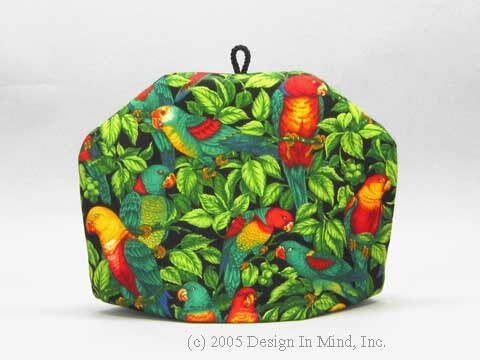 Brightly colored parrots and green branches adorn this black background quilters cotton. 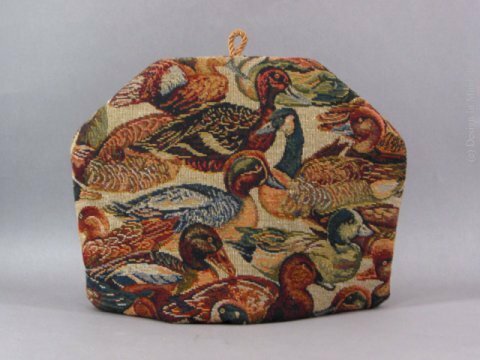 Taupe tapestry woven with ducks and geese in a deep burgundy, hunter green, black, and gold. 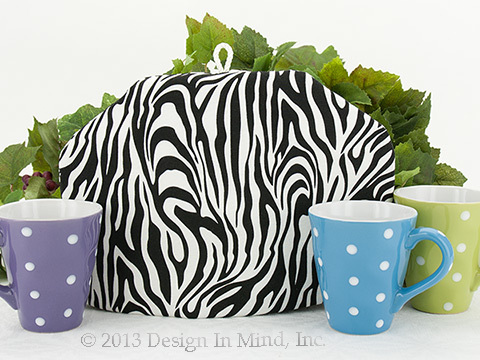 One side of this tea cozy is white with black stripes, the other is black with white-you decide which is which. Sturdy knit fabric. Shown with an assortment of our Sprinkle mugs. 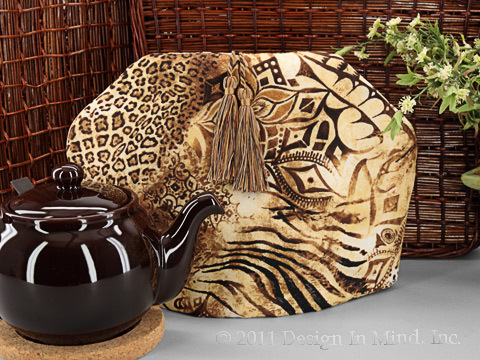 You are on Safari with this Tea Cozy. Lions, tigers, cheetahs, and zebras. It's an I Spy game in shades of brown and tan with a hint of black. Quilters cotton with a fabulous double tassel "tail".